What Kinds of Animals Dig Burrows, Then Abandon Them? A quick hike around a natural area in your neighborhood could result in the discovery of many different types of burrows. Some burrows are less than 2 inches in diameter and go straight into the ground; others may be large, half-moon-shaped burrows that angle slowly down from the surface. Many animals dig and later abandon burrows, but not all seemingly abandoned burrows are uninhabited. Many animals are considered burrowing animals, but not all of the members of this exclusive group dig the burrows themselves. Many smaller mammals dig their own burrows, including woodchucks, badgers, chipmunks and other ground squirrels, moles, voles, shrews and rats. The gopher tortoise, an endangered species native to the Southeast, also digs its own burrow. On occasion, foxes will dig their own burrows and a few other burrowing animals will sometimes excavate their own homes. Some creatures dig more than one burrow at a time, giving them ample areas to escape from inclement weather or predators. A seemingly abandoned burrow may just be an extra burrow at the other end of the creature's territory. Oftentimes animals will abandon one or more burrows for any number of reasons. 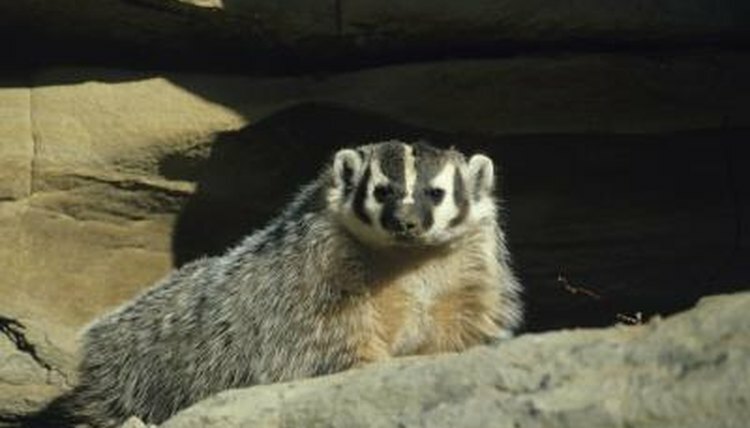 If the burrow is found by a predator, other danger persists in the area, food has declined or the surrounding land has changed, they will relocate to another burrow. In some cases, another animal moves in. In other cases, what seems to be an empty burrow may actually be the home of an animal that is particularly reclusive. Woodchucks, for example, are active during dawn, dusk and throughout the day, so discovering an active woodchuck burrow during these times may yield no evidence of the creature. Woodchucks also hibernate for approximately half the year, so it may seem a burrow is abandoned during these times while the woodchuck is inactive. Burrows on your property can unfortunately cause problems that you need to address. Chipmunks and woodchucks often burrow beside sidewalks and the water that flows into their burrows can cause concrete upheaval. Foxes, raccoons and woodchucks may burrow under buildings. Harassing the animal away from the burrow and then filling it in and repairing the damage is the best way to go about damage repair. An abandoned burrow won't often stay abandoned for long. Some burrowing creatures rarely dig their own burrows and rely on other creatures to make their homes for them. Coyotes, foxes and burrowing owls all steal preconstructed burrows to use as their own. Burrows can also be an important factor in the local ecosystem; gopher tortoises are one such example. Several creatures will live in the gopher tortoise's burrow alongside the tortoise. Other creatures, including rabbits, armadillos, foxes and skunks, will also rehab the tortoise burrow into a safe, secure home of their own. More than 350 different species inhabit gopher tortoise burrows, making them a keystone species in their native habitat. Why Do Tortoises Burrow Underground?